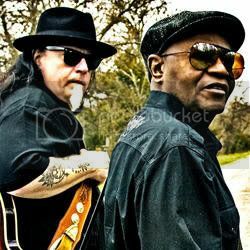 We could, should, and usually start at the top of the chart but this week we are looking at #20 where Smokin' Joe Kubek and Bnois King's Have Blues, Will Travel re-enters the chart. We start there because I say so and it pleases me to see this album getting more life. It was higher on the charts when released last year. It's good Texas roadhouse blues-rock. We should also point to a couple new releases that have made their presence on the chart: Stony Plains Records' 35th Anniversary set featured previously unreleased music from slide master Robert Nighthawk, and those songs have been spun a lot the past week. Another Stony Plain release, Harry Man and Kevin Breit's Strictly Whatever, is also here. So, what's up top? Marcia Ball and Gregg Allman. Sound familiar? It should. They're good records and they've owned the charts since their respective release.